Maja Dlugolecki knows how to inhabit the intersection of art and life with graceful intention. 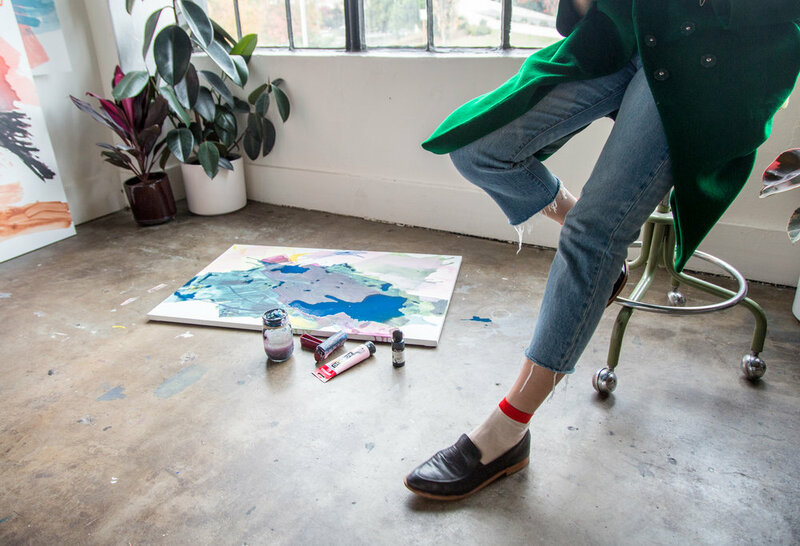 Over two years ago, the Portland-based visual designer went through a painful break-up and began painting as a way to cope. What began as a mechanism for processing emotional trauma has transformed into a body of work that exudes balance & harmony. 'Slow-ambition' is a phrase that can be coined to describe Maja's philosophy towards manifesting growth. Owed to her innate sense of trust in the process of life & creating, her work is as confident and contemplative as she is. Maja's commercial success comes of an ability to take work which is raw and personal and turn it outwards in a way that is accessible to many; She creates a narrative around her art that expresses the visceral sentiments at the core of them. Below, a studio visit with Maja and her thoughts on connecting with nature, her community & the importance of patience in her practice. You were born and raised just outside of Portland and continue to live there today. What is it like to be a part of Portland's creative community? Do you feel you have all the support and opportunities you need to thrive there as an artist and designer? Portland has raised me in so many ways, as an artist and human being. I have so much gratitude for my mentors in the design program at Portland State University, the people who come out for my shows, and the people who invest in my work by supporting my ideas and projects. The creatives surrounding me have undoubtedly influenced my practice and interests. I feel very lucky to live in a city that is so supportive of the arts and gives validation to pursuing art as a career. You trained as a graphic designer but later taught yourself how to paint. How would you describe the relationship between your graphic design work and your fine art work? Is there a division, can one exist without the other, do they inform one another? I think the two go hand-in-hand in my case. I honed in my personal aesthetic early on—which is very clean and minimal—while also understanding the ins and outs of technical elements like building websites, printing etc. I worked as an independent contractor for 4 years with a variety of brands from Harlow to Nike, while painting on the side to remain fulfilled creatively. Today I split my time between painting and creative direction for Phylos Bioscience. Some days I’m head down in my studio to work on commissions or a new collection, and other weeks I’m on set for a shoot or working on strategy and campaigns with the marketing team at Phylos. Your mother is Polish and your dad is first generation Polish. How has your background influenced your upbringing? Have you been to Poland? A lot of your work is created while on your travels. Tell us about your painting trips-- are they artist residencies or personal journeys to paint? How do you choose a place? I treat any new environment as an opportunity to experiment with new methods, colors, and compositions. As a self-taught painter I am always dabbling in new ways to paint, and especially enjoy finding ways to manipulate paint to move in different ways on the substrate. I travel to find inspiration in the landscapes and people I encounter, which varies from calmer secluded places like Joseph, OR, to larger invigorating cities like NYC and Berlin. You’ve done a lot of open-air painting the middle of the wilderness. Describe working in nature vs working in the studio. How do you think the two environments affect your work? I feel most creative in nature. My studio is also a sanctuary, but it has more distractions than open fields, the woods, or a cliff overlooking the coast. I find balance by taking inspiration from swatches made in nature into my studio, where I can expand on those original ideas with more color, space, and variations. You’ve mentioned that your work is influenced by Helen Frankthaler’s soak-staining technique-- who are some other artists that inform your work? Perle Fine, Alma Thomas, Joan Mitchell, Mary Abbott, Grace Hartigan, Judith Godwin, Miro, Cleve Gray, and Cy Twombly. Do you have any mentors? What is your support system as an artist and as an entrepreneur? My mentors are my parents, friends, and other movers and shakers in Portland. My father is an artisan string maker with a worldwide clientele in the early string music world. Growing up in an environment where I saw him working 7 days a week with never-ending perseverance to create the absolute best strings on the market has shaped much of my own work ethic today. I’ve had many mentors as a designer, but as a painter I’ve really pushed myself on my own. I began painting to cope with trauma, so I think the fact that I built myself up from a low point to where I’m at today has made me confident in my ability to work tirelessly to better myself and my work. I also believe that mentors come into your life in a way that you can’t plan for or predict, so I’d say that I am looking forward to crossing paths with more people who will provide guidance and insight into my work as a painter. What are some techniques you use to remove creative blockages? Sometimes I’ll paint with my left hand, or with my eyes closed. Every layer tells a different story, and makes the final finished piece unpredictable. I like to work in a way that lends itself to the unknown and taking chances. Describe your personal style--What do you wear to feel powerful or most like yourself? My personal style is a mix of timeless cuts, pops of color, silver and gold jewelry, and dope sneakers. My go-to studio outfit includes vintage levi’s boyfriend jeans with a vintage T or crewneck sweater, hoops and a top bun. And, there is usually paint on one or more articles of clothing ☺ If I’m feelin’ myself I’ll wear my forest green coco Saloni coat over a nice button up or crop top with high-waisted denim or black dickies and my ZOU XOU black snake leather loafers or a chunky heel. My go-to client meeting spots are in a very small radius of my studio in the industrial east side of Portland. I’ll pick up an americano with an inch of coconut milk at Water Ave, or happy hour bubbles with a dish of Ken’s artisan bread and butter at clarklewis. The Doug Fir and Wonder Ballroom are my favorite music venues for their intimate space and solid lineups. I’m circling back to clarklewis for date night—the food and service is excellent and you can’t beat their happy hour. And to get inspired I get the hell out of the city. Chinidere Mountain or the 12-mile coastline stretch along the Boardman State Scenic Corridor are my top picks. In an Instagram post from 3.17.17, you wrote that you remind yourself to respect the process of life and art, always. Would you tell us more about what respecting the process of life and art means to you? I have a quote taped above my desk that reads: ‘Patience is the calm acceptance that things can happen in a different order than the one you have in mind.’ There is a lot of work that I don’t publish publicly because it is my own personal growth, and sometimes I’ll come back to it with a new idea, and rework it and then I love it. A big part of my process is making work that I hate in order to make work that I love. It’s pushing what is comfortable into something uncomfortable that leads me to something new, and sometimes it’s beautiful. I am confident that the pieces of life will fall where they may when the time is right. When I look back on my life today, I can connect all the dots that got me here, and with that understanding, I can trust that what I don’t understand today may make sense tomorrow or a year from now.